As part of the National Future Day 2017, the Vifor Pharma HQ opened its doors to the children of our employees. Seventeen girls and boys at the age of 11 to13 were invited to visit their parents or relatives at work, learn more about the organisation and our daily activities at Vifor Pharma. The day started in our headquarters with a snack and an introductional presentation by Monica Epper, Head of HR Headquarters & St. Gallen. 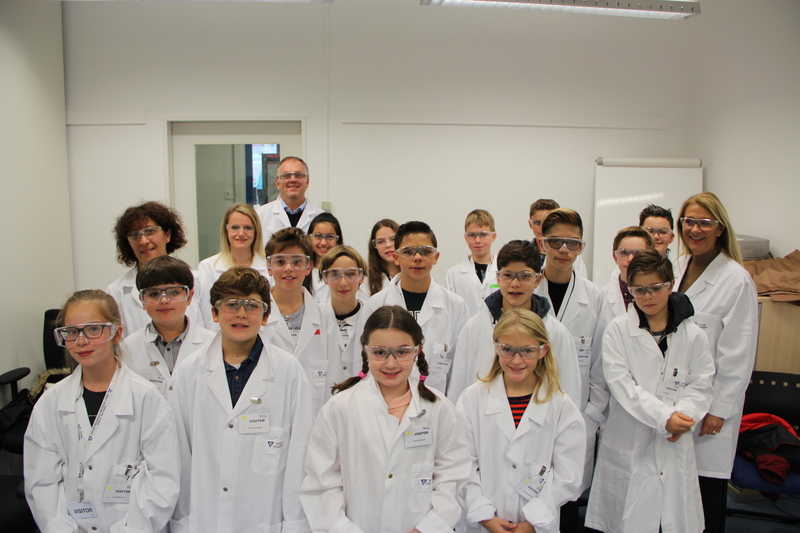 After this warm welcome, the kids travelled together to our laboratories in Schlieren by bus where they were introduced to the daily work of a biologist or chemist. The colleagues in Schlieren showed the kids around in the labs and the children had the opportunity to participate in different experiments. Before driving back, they were invited for pizza together with our Research team in Schlieren. Back at the headquarters, the kids joined a presentation from Cyrill Blättler, our Project Management Lead, who explained in a demonstrative way how our products help patients with iron deficiency. Then it was time to visit their parents or relatives at their workplaces. The kids had the chance to see their daily activities, learn more about their jobs and get to know their parents team members. At the end of this exciting day, the children were invited to give their feedback and wishes for the next future day. The active participation and many questions of the kids showed that they not only were very interested in scientific topics and in doing experiments themselves, but they also gained a broader understanding of their parents or relatives activities at work. A special thanks to all involved Vifor Pharma employees, making this day a special day for our children!